We take extreme care in ensuring all our autographed collectibles are genuine. 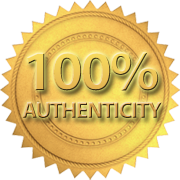 Authentic autographed collectibles � how do we know? It helps when you have an ex-international cricketer on your team. Ian Austin played for England and Lancashire and throughout a distinguished career he met many of the people who helped shape the sporting history of the past 25 years. Music & sports memorabilia brings you closer to your heroes. A signed album captures the moment you saw your heroes play live. An autographed shirt brings back the power of the day you saw them score the goal, bowl a hat-trick or score the try that led to victory. At Sports Legends we understand this. We know what it means to own a piece of history. We know the difference a signature makes and we realise that if it's not authentic it doesn't count. 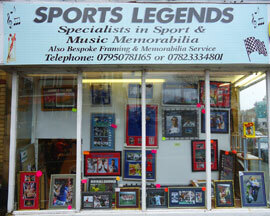 At Sports Legends you'll find unique sports memorabilia , music memorabilia and movie memorabilia, lovingly presented, stylishly framed and all 100% authentic. For the fan. For the collector. For the investor. Signed sports memorabilia and music collectibles are better value at Sports Legends. Our founder is Ian Austin, ex-England and Lancashire cricketer. He understands what it is to be a part of sporting history. And he's committed to helping sports and music fans who want to own a piece of that history. That's why, if you want authentic sports collectibles and music memorabilia at the lowest possible price, you'll find collectible heaven at Sports Legends. Our store is in Lytham St Annes (we're in the St Annes part). If you're nearby why not call in and save yourself the postage costs? You can find directions here.